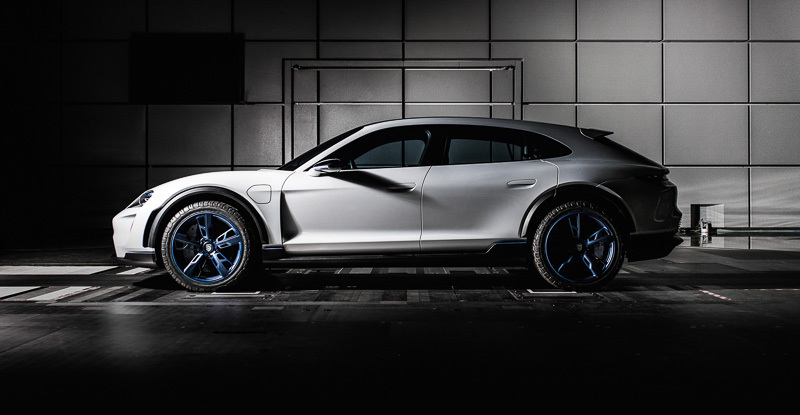 Porsche is unveiling a vehicle with many talents and a spectacular design language at the Geneva Motor Show: the Mission E Cross Turismo. The strengths of this Cross Utility Vehicle (CUV) include an emotional design with striking off-road elements as well as an innovative display and operating concept with touchscreen and eye-tracking control. With a low-cut bonnet between heavily curved wings, the front of the Mission E Cross Turismo reveals its relationship to the iconic Porsche 911 sports car at first glance. Other distinctive design features are vertical air inlets in the front known as air curtains and matrix LED headlights.